Twitter is an important part of my daily life, but not nearly as important as it is to my wife. At the time of writing, I have under 30 followers, her twitter account at @juicybags has somewhere around 1800, and she tweets dozens of times a day. She tweets about the things she’s interested in and the things that she does and so her audience is mostly people with the same interests… crafting, moms, nurses, people on Etsy. The premise is simple… you have a large number of people reading your tweets – why not send them adverts. Magpie will pay you for access to your followers. On the face of it this is nothing more than selling out people who turn to you for advice. How is this different from selling your mailing list for spamming purposes? And many people have seen the launch of Magpie, interpreted it as this and got very hot under the collar about it. I looked at it when it first came out. They have a tool which estimates how much much money you’d make from letting Magpie send messages through your account. I ran my twitter account through… errr €1.35 per month – that’s about $2 and isn’t going to buy me a new car any time soon. I mentioned Magpie to my wife and we ran her account through. Wow – €700 a month! I was still a little reticent about the idea. My wife asked her followers what they thought. Sure, there were one or two “if you sign up for Magpie then I’ll unfollow you” responses but the majority of people either were interested to hear about it or felt that they’d wait & see how it went. So we decided to see how it goes and signed her up. Magpie is NOT a plain old spamming service. It doesn’t send out tweets about fake watches and blue pills. Think of it like Google Adsense. They identify keywords in what you tweet about and their advertisers bid on specific keywords. If there’s a match then the advertiser gets to tweet to your followers. We waited 2 days before they sent their first tweet. If it wasn’t for the “#magpie” and the little hearts, that could have been a post that my wife wrote. Perfect targeting. And we earned €1.61 from that. For most of her followers it was the first Magpie tweet they’d seen. Everyone was excited, everybody liked it. 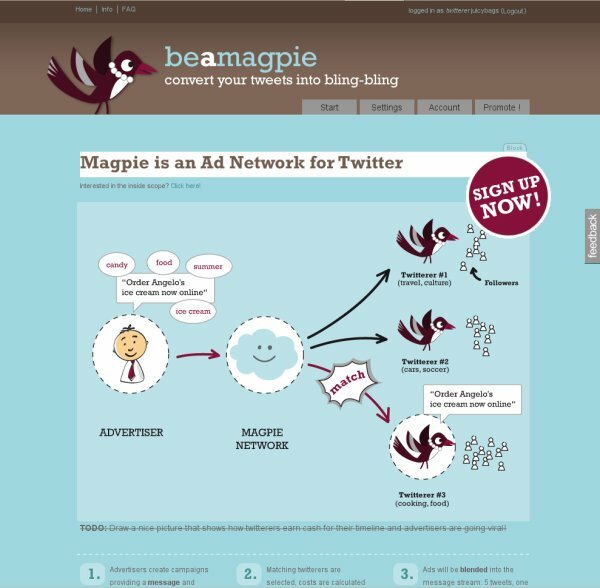 In fact it generated a lot of publicity for Magpie, as well as the advertiser. They’ve been a steady stream ever since… sometimes one a day, sometimes a couple of days between them. And now, after three weeks, our total earnings are up to €27 – about $43. A long way from the estimated total. But frankly this is a very good thing. The ads we’ve seen posted under her name have all been fairly well targeted. Not all as good as the first ones, but all close enough that you can imagine them being of interest to many of her followers. I think this means that Magpie are being cautious with the keywords, not sending things out that aren’t a close match for the twitterer they’re assigning them to. Yes, she’s lost a couple of followers but the majority are happy (or at least not UNhappy) to be receiving the Magpie tweets and her follower count continues to grow by a dozen or more per day. Since it launched, Magpie has added a lot to its feature set. You’ve always been able to vary the rate at which it sends magpie tweets – it feeds its tweets out into your stream according to the frequency at which you post from 1-to-1 (which WOULD be annoying) all the way down to 1 of theirs for every 200 of yours! New features include an affiliate program… you earn commission from the transactions of anybody that signs up as an advertiser through your affiliate link. You can market this through a link on your website/blog or you can set it to tweet automatically about the affiliate program on your timeline and this second option IS annoying. It annoys me much more than any normal Magpie tweets do and the reason is because it’s unrelated to the normal stream of tweets. It IS just spam, pure and simple: not information that I’m interested in – especially when I’ve seen it a dozen times before. Another cool thing they’ve just added is the ability to pre-approve Magpie tweets. This is a GREAT feature. Remember I said that the tweets they’ve sent through our account have been pretty well targeted, but one or two have been just “OK”…ish. Definitely not things that my wife would normally have tweeted about… the Jimi Hendrix replica stage coat for instance. I can see why it happened – it came from a site that sells clothing and jewellery. It just shows that you can’t make a perfect match using exclusively automated keyword matching. The pre-approval feature lets my wife save her followers from things she thinks they won’t be interested in. This looks like it should work great – they’ve sent her a whole stack of potential tweets and she’s looked through them thinking about “does this sound like something I would say?” and “is this the sort of thing that my followers and I chat about?”. She says yes or no to each of them and they go back into Magpie’s stack for possible future tweeting. It looks like the system seeks approval when it first identifies a possible match and not when it’s planning on sending out a new tweet as we haven’t seen anything from her pre-approved list actually being tweeted yet. So our experience has been almost entirely positive. She turned off the auto-promotion of the affiliate scheme yesterday, once she realized how annoying it was. Sure, there is a lot of scope here for mindless spamming but, so far at least, Magpie seem to be fairly good with the targeting. Add in the pre-approval and a bit of sensible consideration from the twitterer for their followers and you have a pretty good platform here. If you search Twitter for #Magpie tweets you will, admittedly, see a lot of tweets that, to me at least, appear to be low-value advertising about tools for SEO, web-billing, shopping carts etc. But think about it – why are these coming out on the timelines that they’re coming out on? It’s because SEO and ecommerce are things that these twitterers normally talk about. There’s a LOT of professional Social Media folks twittering as a means of developing their personal brand. For these people, I think I agree, maybe Magpie is not a sensible option. For them twittering seems to be about expanding your network of contacts and a certain “you scratch my back, I’ll scratch yours” approach to networking and promotion. For that market, at the level where this becomes part of the job description, I don’t think €4 is really the right sort of money for accepting adverts. Developers are fighting back – Twitter clients and browser scripts are starting to appear which have the ability to filter out tweets containing “#magpie”. But Magpie isn’t dead and buried – now it has an option to change, or even remove, the “#Magpie” prefix. Not really a good thing, but if you’re pre-approving only tweets that you’re happy to put your personal brand behind, then maybe not that bad a thing either. As with all things on the Internet, things are moving fast. We’ll just have to see how it evolves. Speaking of targeting… our friend Heather above has an “on topic” comment … but the link is SPAM. I’ve had real trouble with this. Thanks for the writeup. I hadn’t really looked at Magpie, although I had heard about it…will dig a little deeper.